Can’t believe it is nearly the end of June now! Summer holidays are so close and I am ready for summer fun, family parties and celebrations! Today I am sharing a lovely tutorial to make a pretty “Bow-licious Garland” from felt, and through out the month of July I will be sharing extra felt tutorials to continue the party mood! Felt in your party theme colours, I went with vintage colours, you could do red, white and blue, or different shades of pink, or a bright mix. 2m of Ribbon, 9 bows makes about 150cm of bunting and you want to add a bit to the end to tie it up. 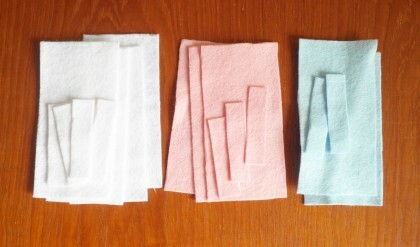 You first want to pick out your felt colours, and decide the order you want it to go in. Keep in mind we will have 9 bows. 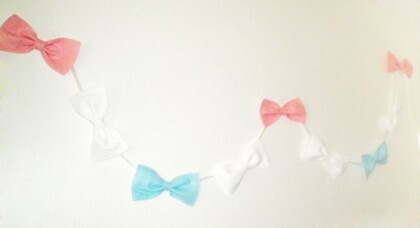 I wanted pink, white, blue, white, pink, white, blue, white, pink as my colours for this garland. You can mix and match the colours, but for each bow you need one piece of 12cm by 6cm and another of 6cm by 1.5cm. Take your ribbon and find the center point and mark it with a pen. Then make another mark 16cm along, and another till you have 4 marks either side of the middle mark (9 total). Take one of your large felt rectangles, and place it under so the middle of the felt is under the mark on the ribbon. 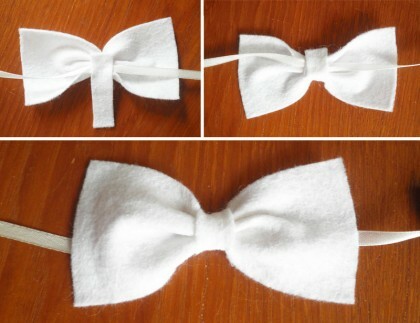 Using a bit of thread make a knot around the middle and pull tight so it pulls the felt into a bow shape. (If your ribbon moves, you can pull it through the thread to get the mark back in the center). 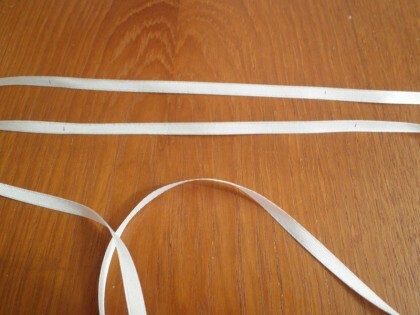 Repeat this along the length of your ribbon at each mark, so you have 9 bows on it. On the back of the bow (side with the ribbon) add a dot of hot glue, and stick your smaller piece of felt down. Wrap the felt around the front of the bow, add another dot of hot glue where you started to stick down the felt. Trim off the excess felt so you don’t see anything from the front. Repeat this for the rest of your bows. I hope you make lots of lovely garlands! And don’t forget to stop back next week for some more felt party decorations!! This entry was posted in Felt, Garland, Tutorials on June 21, 2013 by Handmade Cuddles.